When it comes to re-inking your stamp, most stamps are designed for it to be an easy process. 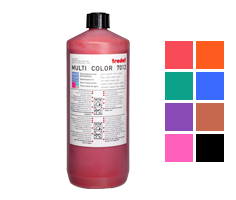 While it may be user-friendly to refill the ink, it can be difficult at times to find the right ink for your model. We have you covered! We offer ink for Ideal, Cosco, Trodat, and Shiny self-inking stamps. These are the four most popular names in stamping and we are honored to carry ink for such quality products. We offer universal ink that can be used in all of these models that are self-inking. This is especially helpful if you own a large collection of stamps. There is no need to find individual ink for each brand with our collection of universal ink! We offer ink for Cosco self-inking stamps, ink for Trodat self-inking stamps, and ink for Shiny self-inking stamps in a variety of colors. Sold in your choice of 1 ounce or 2-ounce bottles, these liquid inks are water based inks using the finest of dyes. They create a crisp, clear impression of vivid clarity and will last for thousands of impressions for an added value. 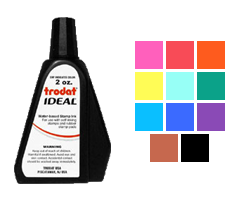 We even offer ink for Ideal self-inking stamps by the liter for an even better buy in terms of value. If you need a large sized bottle of ink, we are available to help you figure out the best option for your needs. We offer these high-quality inks for self-inking stamps in a variety of colors to help you find the one that fits your preferences. Choose from such lively and bold options as black, blue, red, orange, mint, hot pink, purple, and other colors. Find the right ink for your stamp and get back to using your favorite tool today! At Rubber Stamp Champ, we are committed to being your source for outstanding stamping products. We offer the largest selection of trusted names at affordable prices. Find everything you need with our inventory! If you have any questions, our friendly staff would be happy to assist you further in any way while shopping with us. Click the Add to Cart button to select your color.